Could We Have a Natural Control for Horrible Cheatgrass? A cheatgrass monoculture (Bureau of Land Management). If it were possible, I would nominate these scientists for a prize. "We're in a better position to fight back than we have ever been," said Susan Meyer, a U.S. Forest Service research ecologist working with fungus at the Shrub Sciences Laboratory in Provo, Utah. 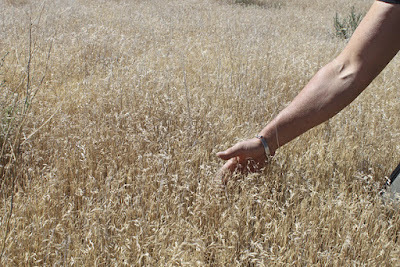 Why is cheatgrass a Bad Thing? • It comes up early in the spring. At that point it is soft and green. It looks good to eat, hence the "cheat" part. • But very soon it sets its seeds in horrible, prickly awns that hurt grazing animals' mouths, puncture people's shoes and socks, catch in other animals' coats, and spread wherever they are carried. • Because it dries out early in the summer, it carries fire easily. The keys to cheatgrass spread are its short life cycle and prolific seed production. Because cheatgrass stands dry out by mid-June, fires are more likely to occur earlier in the season. These mid-summer fires are tough on native forbs and grasses. Cheatgrass seeds drop prior to fires and will germinate with fall precipitation. This gives rise to dense, continuous stands that make additional fire ignition and spread more likely. Fire return intervals have gone from between 60–110 years in sagebrush-dominated systems to less than 5 years under cheatgrass dominance. With every reoccurring fire, cheatgrass becomes more dominant and expands its range further. It can be grazed when young and green, but unlike native perennial grasses, it does not "cure" on the stem for winter consumption. On my own little patch of Colorado, I watched cheatgrass move from roadsides, seemingly leap over healthier pastures, and appear in groves of pines trees. So what Is the new development? Meyer and Ann Kennedy, a scientist in Washington state working with bacteria, are drawing attention from top land managers and policy makers — and research money — after showing that the seemingly invincible cheatgrass might have an Achilles' heel. "We've found several organisms that are really good at colonizing the root of the seed, and reducing the elongation of that root," said Kennedy, who works at Washington State University. "Then that cheatgrass is less competitive the next spring." This will all cost a whole lot of money. But isn't the West worth it? Louie and two smaller pals. When I was in Greece last month, I saw no Eurasian brown bears, since I was on the bear-free island of Corfu. But in the English-language edition of the newspaper Kathimerini (sort of the Wall Street Journal of Greece), I did read about a sanctuary for bears that for one reason or another cannot be released into the wild. In that sense this sanctuary, Arcturos, is more like Mission: Wolf here: it offers fairly large, fairly wild enclosures to animals that still must be fed by their human caretakers. Having eaten his watermelon, 15-year-old Manolis stands up on both feet and appears to wave. His brother, Kyrgiakos, continues to munch away at his own watermelon a few meters away, indifferent to our presence. 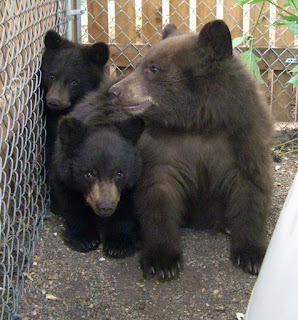 When they were cubs, the two brothers were found by a person who took them in as pets. But when they tipped the scales at 250 kilograms [550 lbs.] and grew to 2 meters in height, they simply became unmanageable. When Arcturos was called in to help, the two bears were completely used to living with people. It would be impossible for them to live in their natural habitat now, which means they will have to live their whole lives in captivity. However, they could do far worse than the Arcturos Sanctuary, an area of some 50 acres offering food, guaranteed care and optimal living conditions. “With more than 450 registered bears, Greece’s bear population is considered one of the most significant in the Balkan region. The bears are part of a common clade ranging from the Swiss Alps to Greece. This new evidence challenges data found in the International Union for Conservation of Nature (IUCN) Red List of endangered species, which suggests that there are no more than 200 bears living in Greece,” Arcturos’s scientific coordinator, Alexandros Karamanlidis, told Kathimerini in a recent interview. Home from our trip, M. and I yesterday visited the local wildlife rehabilitators and saw a Colorado celebrity, Louie the pizza shop bear. Blanca Caro, the Colorado Springs police school resource officer at Palmer High School, said the bear's presence in downtown Monday nearly caused the school to go on lockdown. But further investigation revealed that the animal was not a threat to students and had made its way to Louie's Pizza on North Tejon Street. Lockdown. For a bear cub. I can only hope that they were protecting the bear cub from high school students, not the other way around. Louie and his two companions (from another rescue) were very shy, which is good. The rehabbers predict that with about ten weeks to go, they can have the cubs fat enough to enter hibernation in the wild. I need to drop off a contribution of puppy chow. A 40-pound sack should last them . . . two days? We brought watermelons and acorns yesterday. Both Greek and American bears love watermelon.